In this world, sixteen-year-old Charlotte and her fellow refugees have scraped out an existence on the edge of Britain’s industrial empire. Though they live by the skin of their teeth, they have their health (at least when they can find enough food and avoid the Imperial Labor Gatherers) and each other. When a new exile with no memory of his escape or even his own name seeks shelter in their camp he brings new dangers with him and secrets about the terrible future that awaits all those who have struggled has to live free of the bonds of the empire’s Machineworks. Oh my Andrea Cremer! It’s been quite a few years since I read the Nightshade series, and I’d forgotten how much I love her writing. Wow. 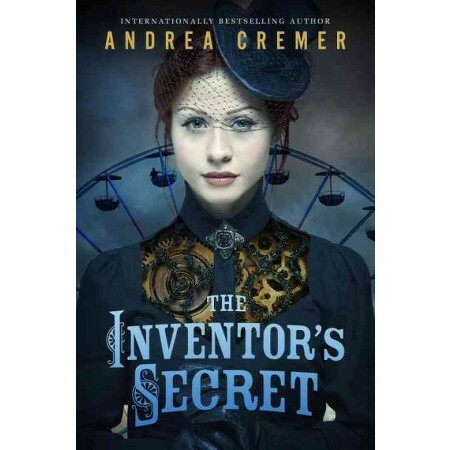 Incredibly rich world building, alternate history, steampunk, witty banter and perfect romance all rolled into book one of the Inventor’s Secret series. There is so much to praise, not sure where to begin. The characters are strong and varied, the history is rich and layered between many civilizations, the relationships are perfect. This is the best steampunk I’ve read, with a twist of the Revenants series a la Amy Plum. Let’s talk about Jack and Charlotte! Their hate each other, fighting all the time turns into the best later scenes in the book. Jack’s brother Coe of the House of Winter is also in hot pursuit of the MC. These two are going to be trouble! I am so excited to read book two, starting today. What took me so long?! 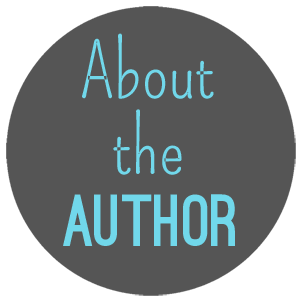 Content: one swear word, mature YA romance and tension. Recommend for older teens. When Lucy Pickett arrives at Blackwell Manor to tend to her ailing cousin, Kate, she finds more than she bargained for. A restless ghost roams the hallways, werewolves have been reported in the area, and vampires lurk across the Scottish border. Lord Miles himself is clearly hiding a secret. He is brash and inhospitable and does not take kindly to visitors—even one as smart and attractive as Miss Pickett. He is unsettled by the mysterious deaths of his new wife, Clara, and his sister, Marie. Could Miles himself be to blame for the deaths? Working together, Miles and Lucy attempt to restore peace to Blackwell Manor. But can Lucy solve the mystery of Miles? Can she love the man—beast and all? There is so much packed into this book. 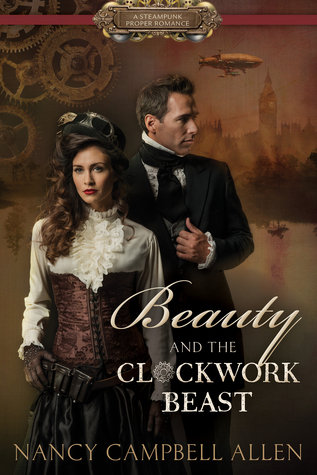 Steampunk, Victorian Era romance, paranormal elements, and plot twists on past storylines pulled from Beauty and the Beast and Jane Austen. About 2/3 of the way through the book I was hooked on main character Miles, earl of Blackwell Manor and his house guest, Lucy. Ms. Picket is trying to solve the mystery of her cousins mysterious illness and in the process meets with ghosts, vampires and automatons. I loved the botanical descriptions and use of old apothecary methods to heal with plants. The plot took a while to get into. The reader may get lost in the world building if they’ve never read steampunk. Tesla was overused a bit. The only other hitch for me was convincing myself that Lucy was not a spinster, but rather a young woman of marrying age. For some reason, there was a lack of the physical and emotional elements that fleshed out her young personality. She was head strong and accomplished, but when the romance picked up I still saw her as 40’s or 50’s in age. I did enjoy this one. Lots of suspense, mystery and rich descriptions. It was a truly one of a kind combination of well-loved tales. Content: drinking, kissing and sensuality. 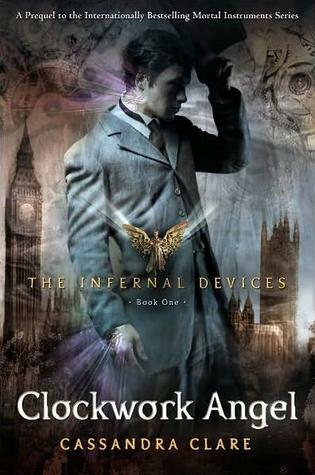 Congrats to Cassandra Clare on the release of her book The Clockwork Angel! Happy Book Birthday! We pre-ordered ours and will be waiting by the mailbox today. 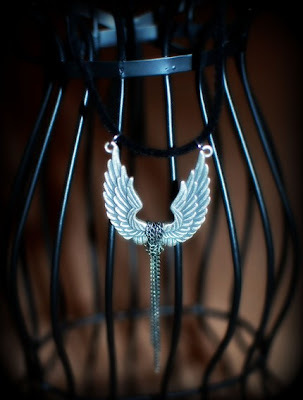 To celebrate we are giving away this piece of jewelry from our Cassie Clare inspired collection on Etsy…suspended wings steampunk necklace. As well we though it would be fun to include these two Texas steampunk graphic novels. 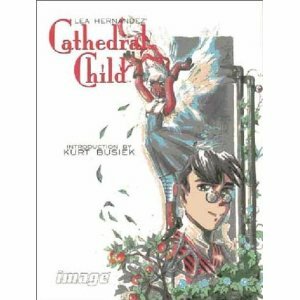 One named “Clockwork Angels” by Lea Hernandez, and the first in his series, Cathedral Child which is signed by the author. To Enter To Win: leave your name in the comments below and tell us your favorite item in our Cassandra Clare or angels Etsy collections. Contest ends September 31, 2010 and is open internationally. Good Luck! “I’m a Mommy. A good day is when I have had enough time to shower and brush my teeth. I seem like a totally suburban housewife by the light of day. But, after a goodnight song, hug and kiss for my babies I turn into the Steampunk Goddess. I spend my long insomnia filled nights working on designs, creating, searching Etsy for things I don’t need but must have or I will die. What is Steampunk? Plain and simple, its old stuff made into something new. There is great beauty in vintage items that can not be found in the mass produced items in chain stores. Why adorn yourself with something hundreds of others have? It seems to me an easier, less painful self expression than a tattoo but with the same effect. Wearing a piece of Steampunk jewelry explains exactly who you are without having to say a word. My art has also been featured in break out new fashion magazine Cry Havoc. Today’s giveaway comes from the Rustic Goth Shop! She has given us two sets of three handmade bookmarks of original art. Here’s her bio “My dark and dreamy paintings and prints are rather sad and surreal in nature, at times a little whimsical and weird. outside of my studio…how I connect with my own feelings. Contest ends on March 25th, 2010 and is open internationally. Please email us of you cannot comment below. Thanks and Good Luck! 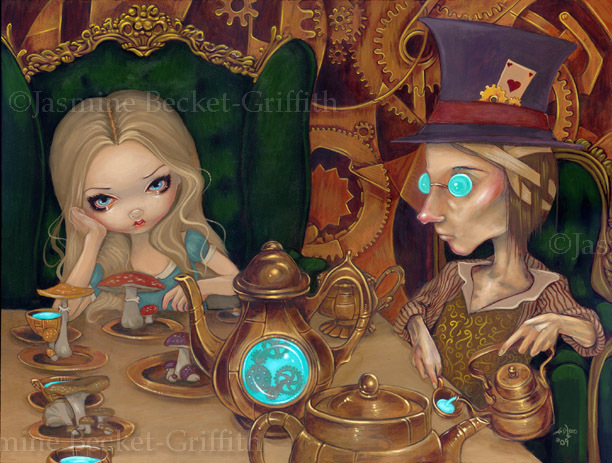 Our giveaway today is for one of three signed prints from Etsy seller and artist Strangeling. Her work is unbelievable! Here’s a little bit more about Jasmine: My name is Jasmine Becket-Griffith. (Aka Strangeling or mis-spelled as Jasmine Beckett-Griffith). I am 30 years old and I live in beautiful Celebration, Florida. I am a full-time artist and I make my living selling my artwork. I have been selling my original Fairy, Gothic, and Fantasy artwork online since 1997. You are purchasing this artwork directly from me, the artist. My original paintings are all acrylics on canvas or wood – all painted by hand, the old-fashioned way. All prints are made by myself & my husband Matty, here in our living room – and signed by me, the artist! I make all of my jewelry myself as well. I feel that it is important for me to sell my work directly to my fans, without the needless expenses or pretension of a gallery or middleman. I grow weary of the mundane world, and I am trying to slowly create my own through my fantasy artwork. I believe that with each piece of art I get out of my system, onto paper, and into your home I have done my part to make this place a more magical planet. 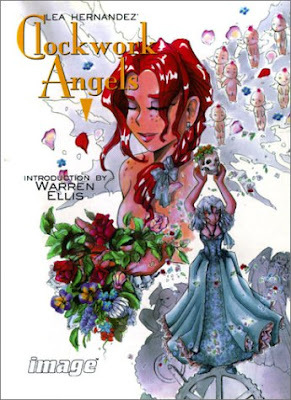 You may know my work from countless books and lines of merchandise, especially through Hot Topic, Torrid, Target, SuperTarget, the Bradford Exchange, Hamilton Collection, etc. as well as my website http://www.strangeling.com/ ! Here is your chance to own the actual artwork. 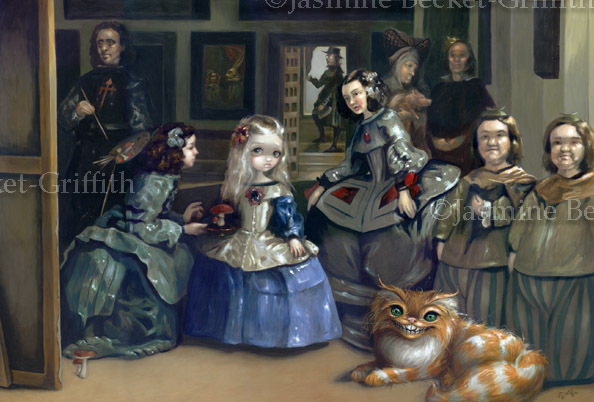 My work can be found in collections and galleries throughout the world, and am featured in the books “The Art of Faery” & “The World of Faery,” “Big Eye Art: Resurrected and Transformed,” “Spectrum” number 11, 13, and 15, “Gothic Art Now,” and others. 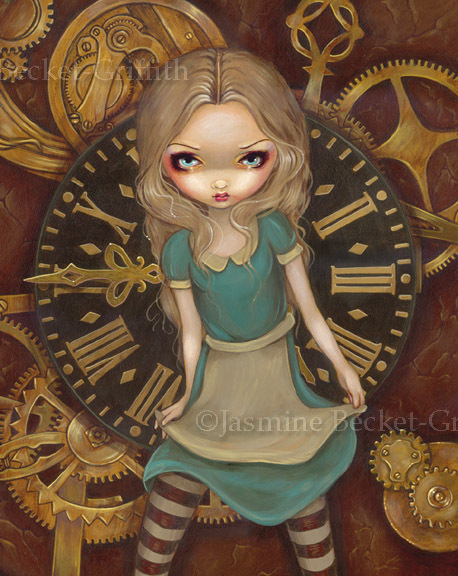 Also be sure to check out my solo art book called “Fairy: the Art of Jasmine Becket-Griffith,” “Jasmine Becket-Griffith: Portfolio Volume I” and my new book “Jasmine Becket-Griffith: Portfolio Volume II” now available. When I’m not painting, I’m reading, spending time with my family, petting my cats (Mama Wolf and Tigrillo), playing outdoors, listening to music, or traveling. I enjoy traveling all over the world, whether it be for my art shows & conventions or just for fun and exploration! I love the ocean and spend a lot of time island hopping in the Caribbean, playing pirate. I also love visiting museums and historic sites throughout Europe. A lot of my travels end up as being sources of inspiration for my paintings! Contest ends March 23rd and is open to International Entries. Good Luck! Contest ends March 14th and is open to International Entries. Good Luck!